French invasion: the largest and most comprehensive exhibition to take place in the UK about the House of Dior arrives at the V&A Museum. It traces the history and impact of one of the 20th century’s most influential couturiers, and the six artistic directors who interpreted his enduring aesthetic. To understand contemporary fashion, one must first understand Dior. The overnight success of his legendary “New Look” in 1947 went on to shape the direction of fashion, redefining the female silhouette and reinvigorating the Post-War Parisian fashion industry. The brand evolved in its own wake over the course of its 60-year history with various designers at the helm, from the daring dresses of Yves Saint Laurent to the rational style of Marc Bohan, the flamboyance of Gianfranco Ferré, the exuberance of John Galliano, the minimalism of Raf Simons, and Maria Grazia Chiuri’s feminist vision of fashion. Based on the former exhibition, ‘Christian Dior: Couturier du Rêve’, organised by the Musée des Arts Decoratifs in Paris, the exhibition at the V&A has been reimagined for the venue and curated by Oriole Cullen, fashion and textiles curator at the V&A. It will be accompanied by a new V&A publication including dramatic images by Laziz Hamani, who also stunningly captured Dior’s most iconic dresses and gowns for the series of seven Dior books published by Assouline, starting from a book on Monsieur Dior himself up until the current era of Maria Grazia Chiuri. Interestingly, the UK exhibition also includes a new section exploring Christian Dior’s fascination with British culture. In addition to his penchant for Savile Row suits, he was once quoted, saying: “There is no other country in the world, besides my own, whose way of life I like so much. I love English traditions, English politeness, English architecture. I even love English cooking.” On the heels of his international success, in 1947, he hosted his first UK fashion show at London’s Savoy Hotel, and in 1952 established Christian Dior London. Dior’s creative collaborations with influential British manufacturers, and his most notable British clients, from author Nancy Mitford to ballet dancer Margot Fonteyn are also highlighted, as well as the Christian Dior dress worn by Princess Margaret for her 21st birthday celebrations. The show also brings to life Dior’s spectacular fashion shows staged in the UK’s most luxurious stately homes, including Blenheim Palace in 1954. Christian Dior was instrumental in establishing Paris as the perennial global fashion capital, with the breadth, depth and duration of his influence still difficult to fully measure. Fashion lovers brace yourselves ‒ the leading fashion houses are ready reveal their latest creations at the major upcoming Fashion Weeks. Here’s what to expect when the world-class catwalk comes to town. At The Beverly Hills Hotel we’ve teamed up with fashion guru Natalie Bloomingdale, creator of The SIL – aka ‘The Stuff I Love’. With a team of talented designers, the SIL’s first capsule collection pays homage to the iconic design of our beloved hotel. Milan’s history is so intrinsically linked with fashion that it’s no surprise we locals take great pride in our appearance. It’s not all about the latest trends though, for most of us it’s about the finest fabrics, timeless elegance and not being afraid to experiment – fashion should always be fun. Our famous banana leaf print wallpaper is a style icon in its own right. Take a trip to our Signature Shop and you’ll soon see how it’s now adorns everything from swimsuits to uber-cool shoes. Our familiar pink façade and the green & white striped décor are also the inspiration for many of the other delights available in our shop. In celebration of the 20th anniversary of Asprey’s boutique at The Beverly Hills Hotel, the house has created a new range of handbags, named the Beverly Hills collection inspired by our legendary hotel. From the signature banana-leaf print, to our charming cabana stripes, the collection exudes an elegant Hollywood style. 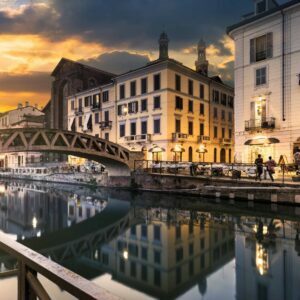 Milan is a popular destination for fashion all year round, and during Fashion Week, the streets buzz with designers, models, photographers and journalists, who all descend on the city to take part in the biggest event on the Milanese calendar.